I’m trying something new. I’m taking photos during the week and then writing all my blog posts on the weekend when I have a little more time and scheduling them to post. I’m aiming for shorter more frequent updates rather than a massive occasional post. 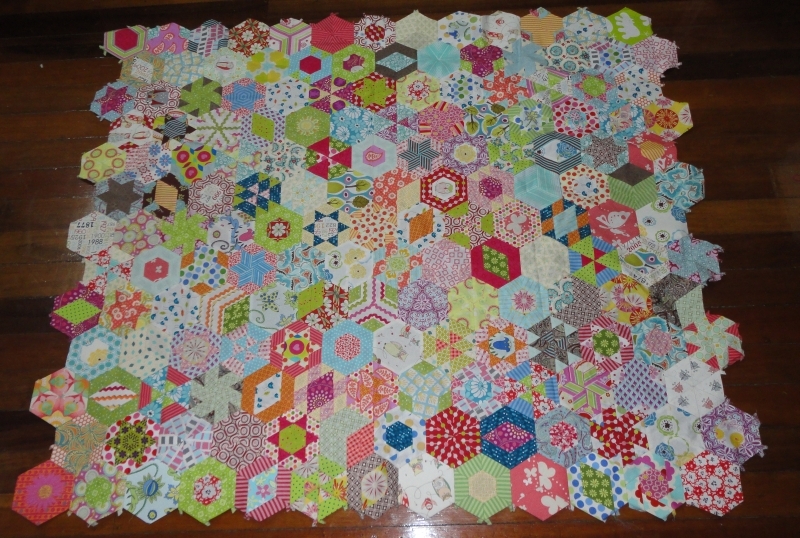 Work continues on the hexagon quilt. The latest block. Sewn into a row ready to be added to the bottom of the quilt top. I went to prep some more blocks a few days ago and discovered that I’m out of two of the paper piecing shapes I use most. I will need to get this row sewn on and then spend some time removing paper from the back of the previous row for reuse. There should be quilt top photos coming soon. Just popping in with another hexagon block to show. I’m really pleased with this one. I’m at the stage where nearly all the prepared hexagons are sewn up, so the next step is to start adding them to the quilt top. I also need to start cutting out fabric and preparing the next batch of hexagons for piecing. 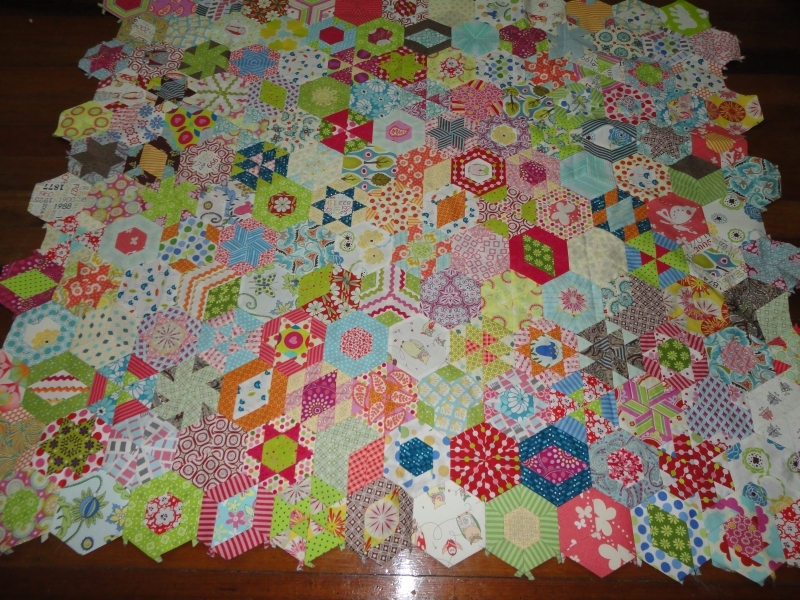 It’s been a while since I’ve talked about the hexagon quilt. So I thought I might start sharing the blocks as I put them together rather than an update every few months when I add a row. I’ve been working on these on plane trips and trying to put in a few stitches one night a week. This is a long-term slow project. I’ve found the fabric on the left really hard to use. It came as part of the kit when I bought the templates, papers and fabric for this quilt. I found the orange spots in a fabric store in Cairns, Queensland and I think they work really well together, so I’m happy about this one. I love this one. I fussy cut the centre. Not quite perfect, but effective. The hexagon and the triangle fabric were part of the kit for this quilt. The diamond fabric is one I picked up when I was lucky enough to win a gift certificate to Little Crafty Shop on Red Pepper Quilts blog. I’m really enjoying putting this quilt together. I hope you enjoyed a peek at my progress. 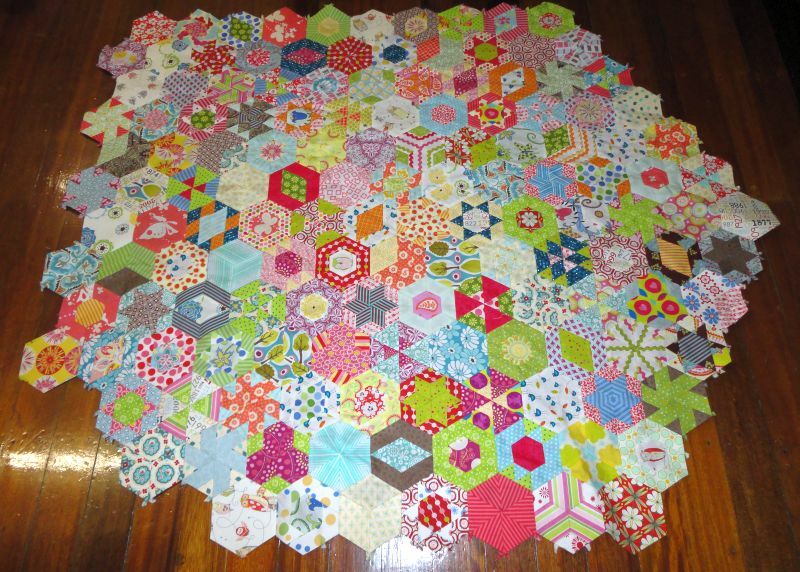 The hexagon quilt has been sadly neglected this year. A few days ago I pulled it out and inspired by Faeries and Fibres decided to try a new (to me) way of adding the hexagons. You see I’ve been adding each hexagon individually and it’s been very slow. However, sewing a strip of hexagons and then adding that strip has significantly speeded up the process. I now have a square top. This is going to be a queen-sized top, so there’s a long way to go. But I’m pleased with how it is coming together. It’s a riot of colour. Gorgeous Man asked if I would be doing another one and I replied that I would. But I would use only one pattern for the quilt next time. Perhaps it’s my sewing, but each of the patterns make a slightly different sized hexagon which makes challenges putting them together. I’m now putting this together so quickly that I need to prep some more pieced hexagons to add. 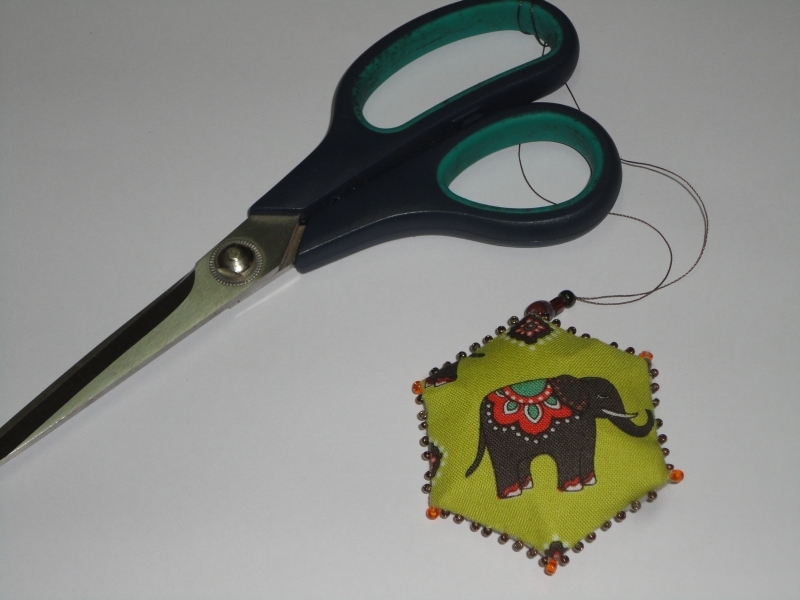 Scissor fob – Christmas ornament? 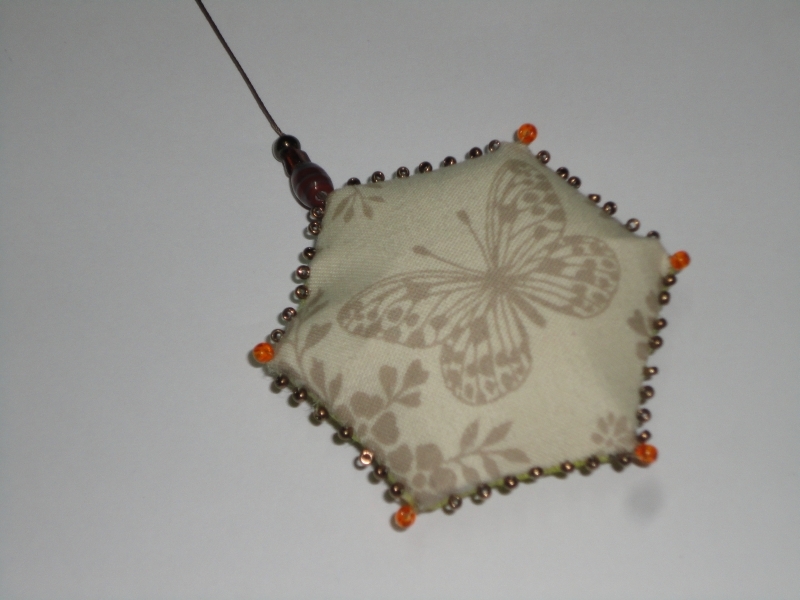 Recently Karen at Faeries and Fibres posted about the scissor fobs she makes. (She has a really great tutorial here). If you haven’t checked out her blog you really should, she does amazing things with hexagons. Anyway, I asked a question about her process and Karen very generously offered to send me some beading cord – beading cord being (as yet) unfound by me in PNG. The envelope arrived today and not only did she send me some beading cord, but she also popped a few bits of fabric into the envelope as well. Thank you so much Karen. Since I had emailed off a draft of my thesis to one of my advisors in the morning I felt justified in taking the afternoon off to play with fabric and beads. I used the fabrics that Karen sent because they were so darn cute and the beads came from the bead stash. Gorgeous Man was very impressed (when he thought it was a Christmas ornament). Actually, that’s not a bad idea and if I find some free time after the thesis is finished and the Christmas gifts are made I may whip up a few for that purpose. I say whip up a few because really this only took an hour or so to make, the longest part was sewing the beads around the edges. Nothing like instant gratification and another Christmas gift done off the Christmas list. 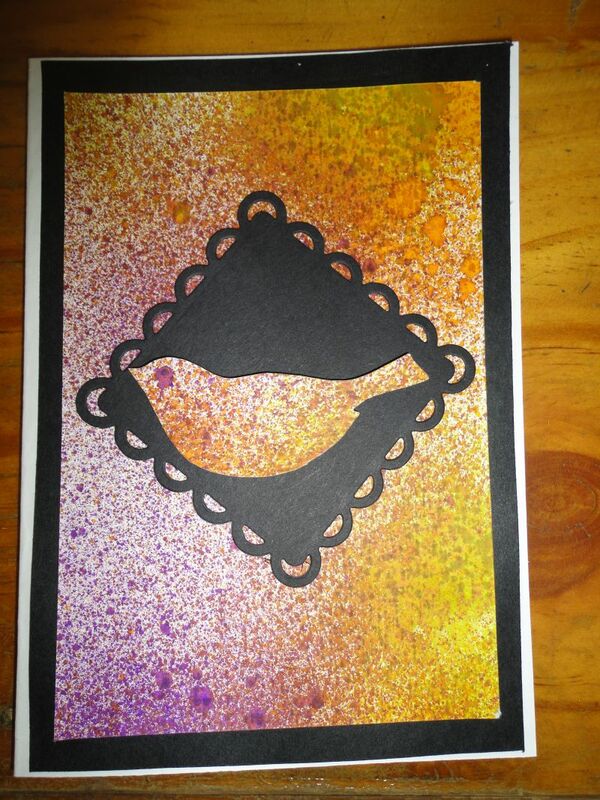 I made a card recently too. That’s about all the crafting I’ve got to show.